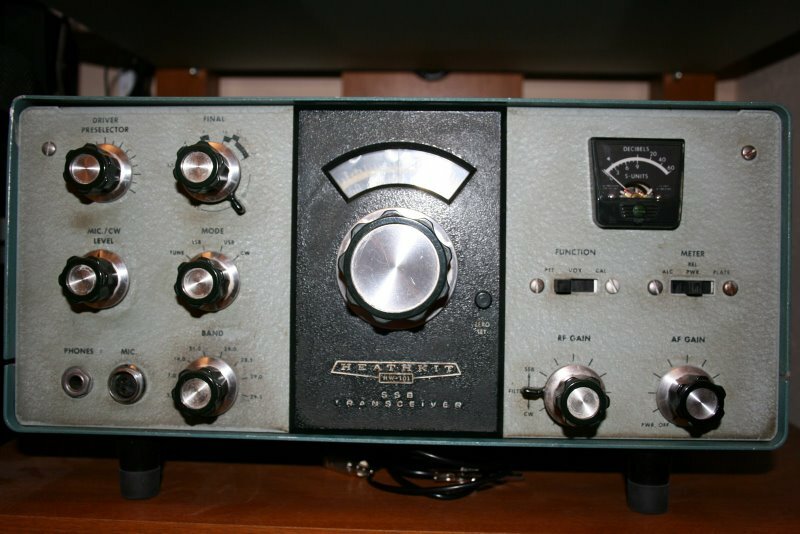 Over the Holidays, finished the recap the <a href=”http://mikeyancey.com/S-120_refurb.php”>Hallicrafters S-120</a> that had been in the office. Finished the <a href=”http://mikeyancey.com/S-38B_refurb.php”>Hallicrafters S-38B</a>; it’s seen some daily use in my office at work. This is my first run-in with the AC-DC power issue and I found a way to route the power cord ‘HOT’ through the switch to eliminate (unless the house wiring at the socket is reversed) shocks from a faulty cabinet insulator. I snagged three Astron power supplies recently from a listing on Craigslist. It was quite an inexpensive buy, but they were heavily abused and needed some repair, so overall, it won’t work out to a huge profit, but it gives me an opportunity to apply some skill and come out on top. The previous user, I’m told, was a car-stereo seller and used the Astrons in a large display of car stereos. From the group, there was a 35-amp RS-35A which, after testing, appeared to be in fine shape; only the fuse was out of order – the previous user had replaced the 8A ceramic fuse with a 10A glass, 3AG fuse – both incorrect and unsafe. The large value would allow more current to be drawn than what it was designed for; ceramic fuses are more resistant to breaking given the high current. Replaced the fuse, tested the supply for regulation under load and it’s now powering my FT-897D. The two others, both RS-50A models were substantially abused and showed signs of having been run well over-current and for longer than the 50% duty-cycle. But both still provided regulated voltage! Both had incorrect fuses – replaced both with correct 10A, ceramic fuses. One had a 20A, 32V fuse (on the 120V primary!). Both had burned wires and the large filter caps (100,000uf in one and two 51,000uf in the other) were toasted. Astron supplies replacement parts, so I’ve already repaired and tested the newer model with the single 100,000uf cap. Now waiting for two 64,000uf caps to repair the other. I had to make replacement 13.8-volt ‘common’ cables with black, 10ga wire. That ought-a hold ’em. How a Club Loaner Rig Becomes New Again. This seemed like an extensive redo, but was not, because many of the boards went mostly untouched. 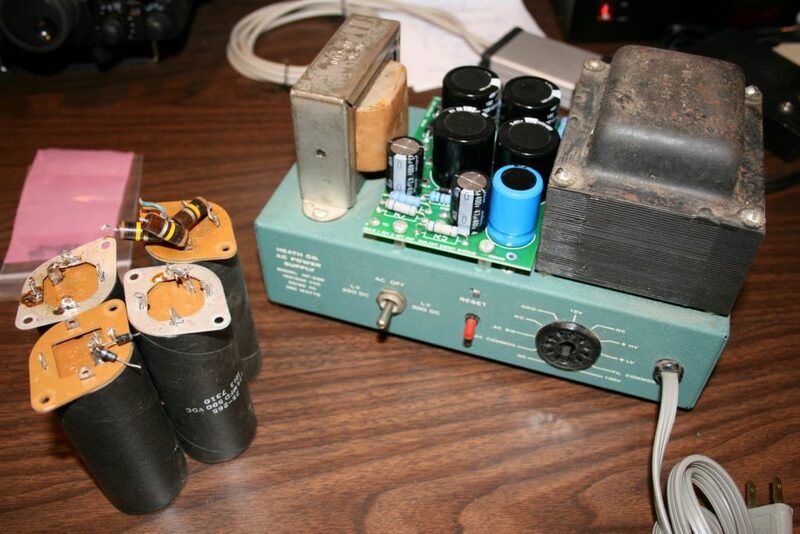 It began with a redo of the HP-23 power supply with an HP-23RL board from The Heathkit Shop. And it ended with replacement of two of the Carrier Oscillator crystals, which with age had changed too much to adjust with serial or parallel capacitance. For kits anyway, this was the pinnacle – the tip-top. 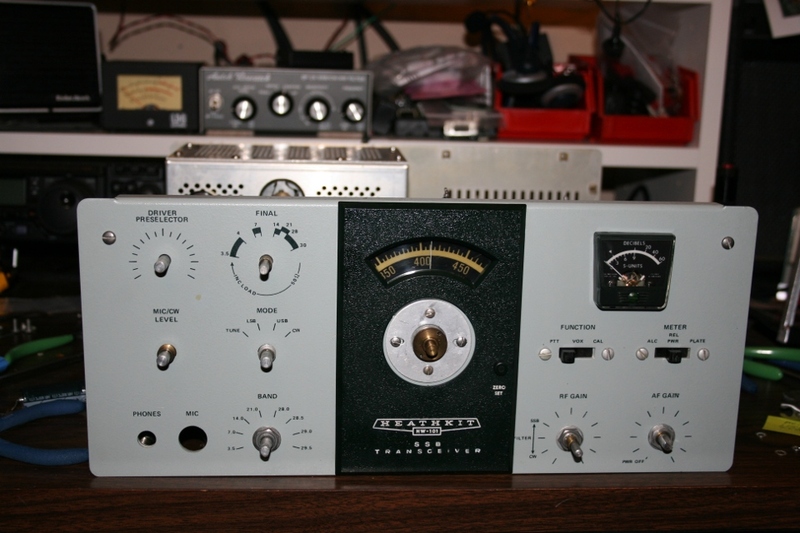 No one would ever make a 20-vacuum tube transceiver again. club sale of some old gear. The radio worked, having been gone through by the venerable OM, Don (W9VE). on 40m were made every time the rig was powered up! the HP-23B power supply can be found for well over $75 all the time on eBay. The front panel was dirty and worn from about 35 years of use and storage. The new panel was found on eBay for about $11 and makes the old boatanchor look new. with the box, instructions, and (blank) registration card for $9.99 on eBay. I chose to only do invisible or ‘functional’ mods which didn’t significantly alter the radio. But here are a list of Service Bulletins and the most popular (and necessary) Mods. Replaced most the electronic parts with the HP-23RL board from The Heathkit Shop. and the rig, found their way to Texas and via K5BJI (Mike Goidl), I obtained the supply. As a result of all the research, I’ve found some superb resources for part. Here are a few. Leeds Radio in New York. for bad out-of-spec parts that might show up in performance, but the rig is working nicely! Replaced the front panel with a fresh, clean one. Replaced some missing cabinet screws. Improved the power supply with a re-cap via the HP-23RL board, cleaning up some poor assembly and soldering. Converted to handle Low-Z headphones – external speaker now mutes properly with “modern” 32-ohm headphones. Killed most of the CW side-tone audio on key-up by dumping sidetone to ground. Some mods had already been done, including the meter zeroing issue and some TX/RX improvements. Replaced the poorly soldered Amphenol MIC jack. Replace the USB and CW carrier oscillator crystals – bringing the CW and USB right back into IF passband, probably within 100hz or so. Replace the old RCA RF Out jack with a BNC connector. The BNC is better than either the old RCA or a ‘UHF’ connector, plus the single-hole, bulkhead mount BNC didn’t require enlarging the hole. Actually found a nearly broken output connection while replacing the RCA antenna connector – fixed. Decided to not add a volume control to the side-tone. Maybe at a later date. Replaced the grotty old 1/4 inch headphone jack. Swapped the 6EA8 Speech Amplifier (V1) with the 6GH8A which is a higher output version. My 25-year-old Weller WTCP gave out. I was repairing one of the two Astron RS-50A power supplies I picked up recently and when I swapped the tips to get more heat out to the massive transformer center-tap… nothing. No clicking. The neon light was on, but no heat was home. It was a terrible discovery. I’d had that old iron since Mostek. I think I bought it at some employee discount. Lots of projects from the old days and from recently were completed with that good ol’ tool. So, my choices were to buy a replacement soldering pencil from Fry’s for $69.99, or just get a new one; the WES51 is not much more and is ESD and has a variable heat control. So I sprung for the new iron. But now: what to do – part out my old friend? Can’t let that 2A transformer go to waste. But I can’t hack apart an old friend. Aw, heck, went right back to Fry’s and snagged a TC-201A pencil to go with it. Now it’s the garage soldering iron. I think we have soldering covered here at the house.